This is the second fully brakeless model we offer; The HENCH. This bike lives up to its name, designed for the street rider, we’ve beefed up this bike with stronger frame, featured gussets on both the down and top tube, stronger rear hub and heavier duty cranks. This bike is also our only model in the line-up that’s comes loaded with a fat seat and four pegs. Full chromoly Social tapered forks. Full chromoly Social handle bar with smaller diameter cross bar, 8.5″ rise and 28.5″ width. 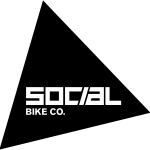 Social FREELOADER front load stem with 51mm reach. Social alloy hubs front and rear with 9T cassette driver, female axle on the front and hollow male axle on the rear with sealed bearings built onto Alienation Black Sheep double wall rear rims.